Terrierman's Daily Dose: What the Hell Is a Congo Terrier? This piece is from the July 2010 issue of Dogs Today. A single breed - the Congo Terrier - sums up the history of dogs. Have you noticed that in the world of dogs, names and places never quite line up? I know digging men in Wales, but none that use a Kennel Club Welsh Terrier to hunt fox to ground. I know digging men in Scotland, but none that use a Scottish terrier. There are no Kennel Club Afghan dogs coursing in South Central Asia. Not too many of those herding sheep in Germany! And in central Africa, the locals are not using "Congo Terriers" that have Kennel Club papers. 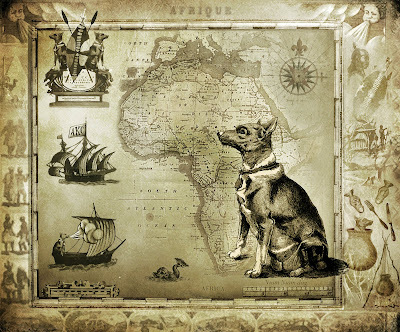 The “Congo terrier” was discovered by explorer Georg Schweinfurth on an expedition to Africa in 1869. He called the dogs "Niam-niam dogs," which described the tribal region where they were found, and he noted they were often quite fat, as the Niam-niam people loved dogs so much they thought nothing of tossing them into the stew pot for dinner! The dogs themselves were spitz-like and barkless, with erect ears and curled tails, as is often the case with primitive dogs. Where the Niam-niam dogs were different was in their relatively small size, their short coat, and the fact that they often featured a white band of fur around their neck. Though Schweinfurth called them Niam-niam dogs, similar animals were found across a wide belt of central Africa, stretching from Liberia in the West, to Sudan in the East. Like many other primitive landrace pariah dogs, the Niam-niam dog had only one estrus a year and rarely barked, but instead vocalized with howls, yodels, and whines similar to those of the wolf, coyote, dingo, or jackal. Of course, a largely silent dog in thick cover is not necessarily an asset. No matter; this deficit was corrected by African hunters who attached a wooden "bell" or clapper to the necks of their dogs so they could more easily drive small game out of thick cover. In 1895, the Niam-niam dog was displayed at the Crufts dog show as the "Congo terrier." The name did not last too long. In the late 1930s, the Congo Terrier was formally brought into the Kennel Club and renamed the "Basenji" -- a Bantu name that meant "village dog." The first order of Kennel Club business was to craft a narrow appearance-based "standard" for the Basenji. This was not hard to do, as only seven dogs were initially admitted. Clearly these seven dogs were perfect specimens of their type! Seven dogs, of course, is not much of a gene pool. In fact, the gene pool of the Basenji never grew much bigger than this. Over the course of the next 60 years, no more than 30 dogs comprised the entire founding stock of the breed in the U.K., the U.S., and Europe. Inbreeding within this small stock of foundation dogs quickly led to a crushing genetic load and a rise in disease. The first issue to raise its head was Hemolytic Anemia. When testing was started, twenty percent of all Basenjis carried this recessive gene. What to do? And cull they did, with about 18 percent of Basenjis weeded out of the American Kennel Club gene pool over the course of a decade. Of course, this deep reduction in an already narrow gene pool sped up the inbreeding merry-go-round. Within a decade, another health problem had popped up: Fanconi syndrome, a type of kidney failure. A health survey found 10 percent of all American Basenjis had Fanconi syndrome, and of these dogs, 76 percent were being bred. The solution, of course, was an outcross. "In five days and 800 kilometers of driving, we saw at least 200 dogs of which only three were not Basenjis." Could anyone driving down the road see the same number of Welsh Terriers in Wales, or Scottish Terriers in Scotland? Impossible! In 1990 the Basenji Club of America successfully petitioned the American Kennel Club to open the AKC registry to African dogs, and 12 were admitted. The addition of 12 African imports helped, but it was not enough. With popular sire selection, inbreeding within the Basenji gene pool continued. And how could it not, with less than a dozen dogs comprising over 95% of the Y chromosomes in Kennel Club dogs across the U.S., Europe and the U.K.? As noted earlier, Basenjis have always been found across a wide swath of central Africa. The early dogs came from the Sudan, Sierra Leon, Liberia, the Cameroon, and the Congo. In 1998, an American Peace Corps worker in Benin reported the country was awash in Basenjis, and that they could be acquired for as little as a dollar. In 2004, an American imported six of these dogs, and they were shown at the 2004 Basenji Club of America Nationals. By then, however, the AKC registry had once again closed. The Basenji Club petitioned the AKC to reopen the registry. This was done in January 2007, with a new closing scheduled for 2013. Will opening the AKC Basenji registry a second time really matter? It will not matter to the Basenjis in Africa, which have never needed saving. The hunting dogs of Africa are protected by those who hunt them. In this regard, they are no different from the working terriers of Wales and Scotland, the coursing dogs of South Central Asia, or bird dogs the world over. But the Basenji community will not be dissuaded. They insist they are "saving" a breed. But what is it that they saving, and who are they saving it from? One thing is clear: Basenji enthusiasts are not trying to save hunting dogs in Africa. You cannot save dogs in Africa by removing them from the continent, and you cannot save a hunting breed by not hunting them at all. So what are the Kennel Club enthusiasts really trying to save? Mostly, they are working to preserve a romantic notion of their own making. For their breed to be special, a Basenji has to be more than another village dog, even if the word "Basenji" means just that in the Lingala language of the Congo. And so, Basenji owners tighten down on what they see as the “special essentials” of their breed. They insist no Basenji should ever bark, and never mind if some always have, and that a barkless dog is such a liability that the Africans themselves bell their dogs when they hunt. And, of course, all Basenjis must have a tightly curled tail, and no matter that a tightly curled tail serves no function in the field. Function? The American and European Basenji is not about function! This dog is about form and fantasy. Hunting? What does hunting have to do with the Basenji? Nothing! Why should Basenjis be held to a working standard when the Kennel Club Welsh Terrier and Scotty are not? This is the Kennel Club, not the African bush. Form trumps function; everyone knows that. And form is maintained by inbreeding right up to the edge of genetic failure. Why should the Basenji be any different in this regard? And so Kennel Club Basenji enthusiasts hold tightly to a breed standard invented in England based on seven dogs. And when shown pictures of small hunting dogs in central Africa that do not quite conform to every aspect of "the standard,” they sniff disdainfully. “Those aren’t Basenjis. Those are nothing more than village hunting dogs." Just ask any Welshman with mud on his boots, calluses on his hands, and a terrier at his heels. What does he know of Welsh terriers? Not a thing! And so we come to the ultimate irony: What are Basenji enthusiasts trying to protect their American and European dog from? Why inbreeding within the closed registry system of the Kennel Club, of course! Very interesting. I have sometimes heard the Basenji called a Congo terrier, only because it was thought they had a European terrier's temperament. I don't think they go to ground during hunting, so terrier is not a great description. However, there are a lot of "terriers" in the AKC that do not go to ground. I was interested in your point about the Basenji being just another village dog. I wonder if this same thing happens with European dog breeds as well. I once showed a few Portuguese friends a Podengo Portugueso and they said it looked just like the general type of village dog from their home. If we looked back to the 18th and 19th centuries in the US, when dogs were allowed a lot more freedom to roam and interbreed, what would the general old village dog have looked like from around here? Most likely not like a Basenji. Great post, Patrick. A young ecologist working in West Africa back in the late 70s was distracted from field work by local pariah dogs, many of which were tripods, and some of which were bipods -- in other words, snare victims of bush meat hunters. They were fit looking dogs with a will to live and they were completely ambulatory, though not up to racing. I'm afraid that's all I know about African pie dogs. Thank you for this. I really appreciate it. I am from Namibia, and we took 2 puppies of the street, thinking they were a Jack Russel cross. These 2 dogs just grew and had ears that stood up and curly tails, and the one in particular had taller hind legs. We wondered what was in these dogs. My boss was here the other day and he is deaf, he just pointed to the dogs and said I must google congo terriers or Basenji. And here I have a history , its awesome! I didnt know of their existence and Im curious. Thank you again. I only truly love my Basenji...probably will never love anything else. American mother, African-import father.